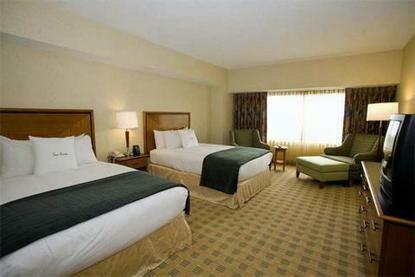 The Doubletree Guest Suites & Conference Center, Downers Grove hotel is situated in Chicago's western suburbs next to Lombard and Oakbrook, Illinois. Centrally located between Chicago O'Hare International Airport (ORD) and Chicago Midway (MDW) the Doubletree Guest Suites Hotel & Conference Center, Downers Grove is the perfect choice for business meetings. Offering an International Association of Conference Center (IACC) approved meeting facility, our comfortable surroundings and exceptional catering team provide the ultimate environment for any business or social occasion. This is the ideal facility for trade shows, conferences, training seminars, weddings, banquets and a variety of other corporate and social gatherings. Let us attend to all the details of your next function with excellence.The Doubletree Guest Suites & Conference Center, Downers Grove Hotel Meeting and Social Facilities and Amenities Available: 30,000+ sq. ft. of versatile function space including the Esplanade Conference Center, 9,500 sq. ft. Esplanade Lakes Banquet Center - 360 degree panoramic lake views, Meeting packages - a one-stop shop maximizing ease and efficiency of event planning, Ergonomic chairs & adjustable lighting - essential for the comfort of your attendees, Two auditoriums - the perfect venue for training.The Doubletree Guest Suites & Conference Center, Downers Grove hotel is convenient to dozens of corporate offices, many within walking distance of our hotel. Here are some local businesses for your information: Accenture, Acxiom, British Petroleum (BP), Caterpillar, Coca Cola Enterprises, Deloitte Consulting, EDS, GRN (Global Recruiters Network), Hewlett Packard, Microsoft, MicroTek, Nationwide Insurance, RR Donnelley, SAP, Siemens, Sara Lee World Headquarters, Washington Mutual, Wells Fargo.The Doubletree Guest Suites & Conference Center hotel in Downers Grove, Illinois offers our customers all the facilities to make this your home away from home. Unwind and refresh in the one-of-a-kind elite Esplanade Fitness Center featuring indoor lap pool, weight room, and indoor basketball and racquetball courts. Dining for all appetites can be found in the Esplanade Restaurant with continental cuisine or in the Atrium Buffet featuring an extensive salad bar, hot entrees or traditional deli favorites.The Doubletree Guest Suites & Conference Center, Downers Grove Hotel Guest Room Features: All accommodations are two-room suites with a bedroom and living room. There is a door to separate both rooms. Complimentary in-suite coffee, daily newspaper, refrigerator, wet bar, sleeper sofa in the living room. Both smoking and non-smoking suites are offered in single, double, triple, and quad occupancy. Rooms with two double beds are limited and must be reserved in advance. Private Executive Level available with upgraded amenities and a concierge lounge open all day serving a complimentary continental breakfast and hors d'oeuvres in the evening. The lounge is open for our business travelers Monday through Thursday from 6:00am - 10:00pm and Friday's from 6:00am - 11:00am.You're close to shopping, dining and entertainment in the Downers Grove, Lombard and Oak Park, Illinois area. Family favorites include the Brookfield Zoo, Morton Arboretum and Yorktown Shopping Mall. Our caring, professional Doubletree Guest Suites & Conference Center, Downers Grove hotel staff looks forward to welcoming you with our very special, signature warm chocolate chip cookie at check-in.